Coming soon page or under construction website templates is the very important for every organization or business when they bought a domain, but they have not launched the development site yet, or under construction or coming soon page very primary option for temporary use. It is extremely helpful if you intend to launch a fresh application or internet projects because it inform your future readers that you are working on something. If you don’t want to lose your readers and visitors, your under construction or coming soon page should have any option that permit visitors subscription to get hot new when your site already done. There are more choices for reader subscription such as Facebook, email subscription, Google, Twitter, Facebook, etc. it will provide you an indication if your new website is all about so it is extremely vital to have creative thinking, design pages under construction or coming soon. 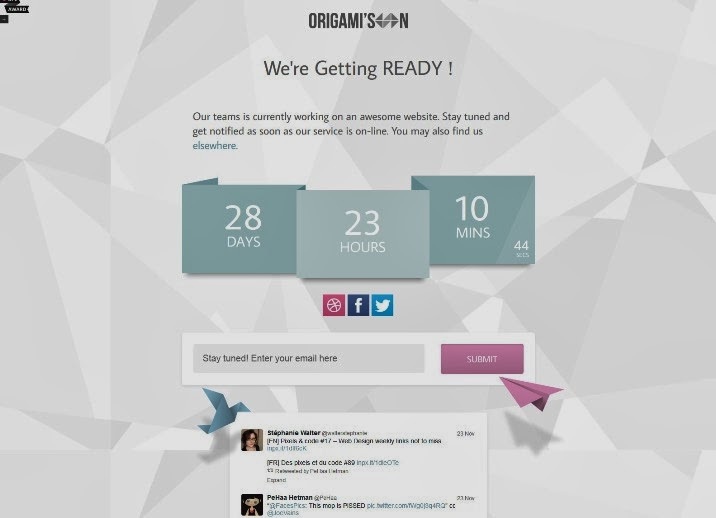 There are lots of under construction and coming soon page templates accessible free for download, some templates have type of graphical for sign up newsletter or launch date time with expert design using JQuery and HTML5 coding. There are also various CMS platforms accessible who can do this job for you with the support of few clicks and you just need to customize it little with some tweaks using CSS and HTML as per your needs. There may be certain possibilities that you have registered your domain and begun making your site at your own or hired a website designing company. At that time, you want to present some message on your domain so that you can display visitors that you are working on your site. 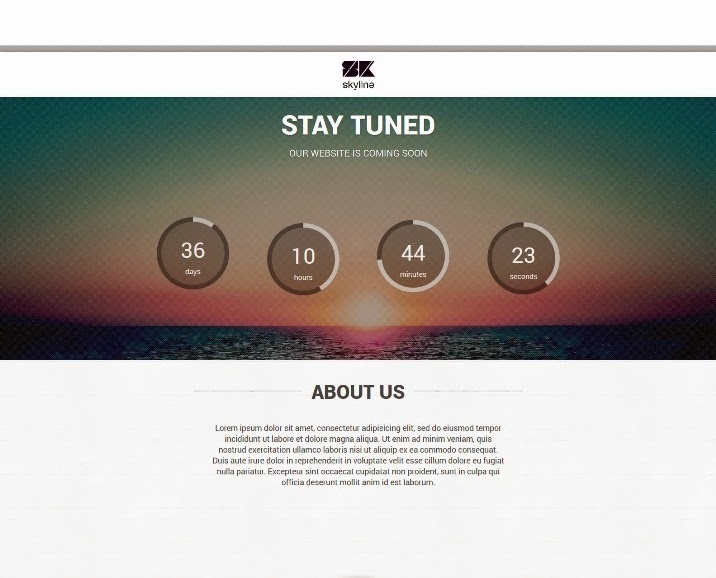 Coming soon templates and free under construction templates can be used in that condition to keep your website live in front of visitors. 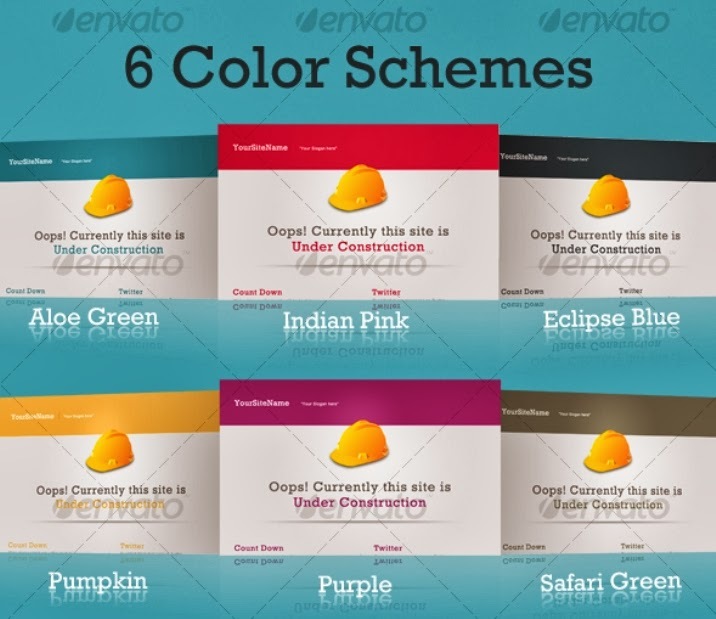 These coming soon and under construction templates are perfectly picked and top suitable for many type of businesses. 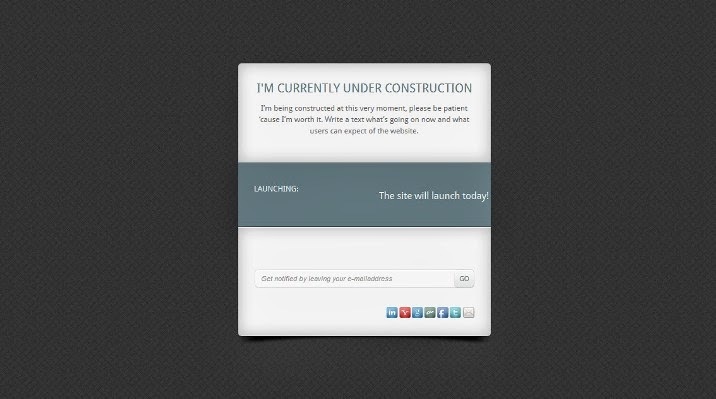 Do check these and get one coming soon and under construction template for your own site. 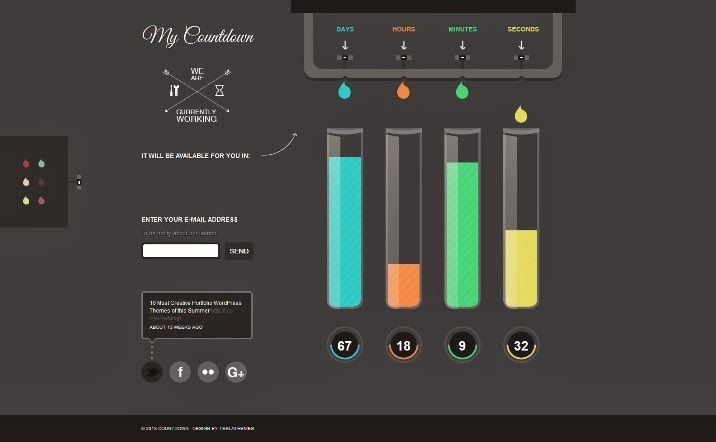 It is truly hard work to find out the best design for you which can solve your objective of using coming soon template. To support you find the best template for your upcoming project we have gathered a list of coming soon and under construction templates. Let’s check them and give a fresh look for your upcoming site until you done its development and design. Features: Full Screen Image Background, 3 Additional Content Pages, 3 Columns, jQuery Countdown, Animated Content Changer with Smooth Transition Effect, Newsletter Subscription Form with Validation, Responsive Layout, Social Media Profiles Support, jQuery Animation Effects, Styled Typography, Valid HTML5 and Multi-Browser Support. Galaxy is a minimal and responsive coming soon template. Features are Countdown Timer, Email Signup with MailChimp Integration, Working Contact Form, Font Awesome Icons, Responsive and Retina Ready. 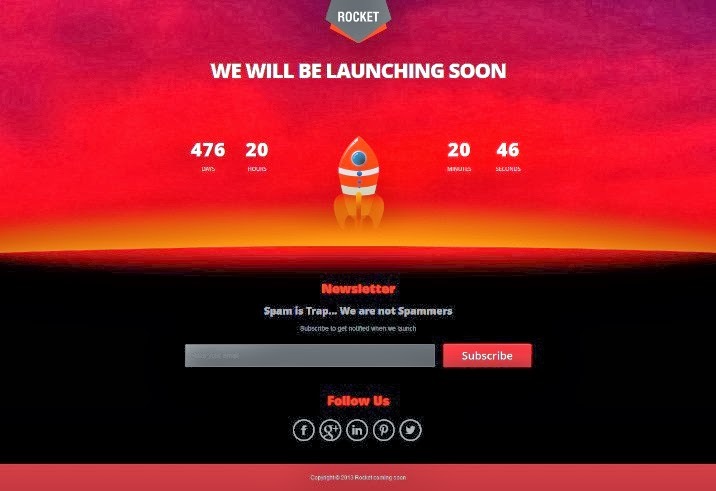 Rocket coming soon is a Super clean Minimalist modern Responsive coming soon template using HTML5 & CSS3 based on Bootstrap 2.3.1. This is a 4 in 1 Coming soon template, where you can choose your own template from 4 different layouts. The Header Background can also change to your custom image to change the Look and feel. Easy customization and Full documentation is included. Compatible with Major Web Browsers and Mobile platform. 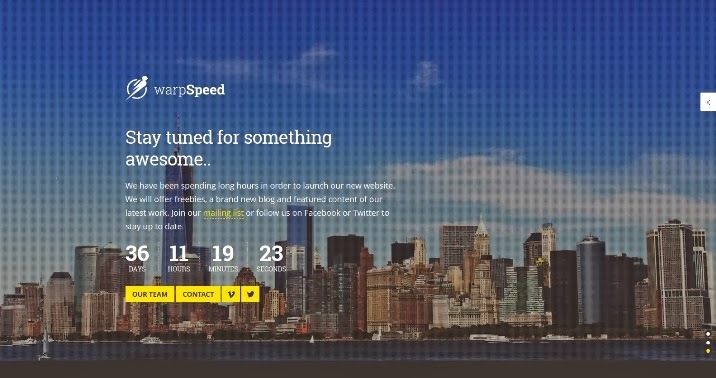 Warpspeed is a Responsive Coming Soon Page. 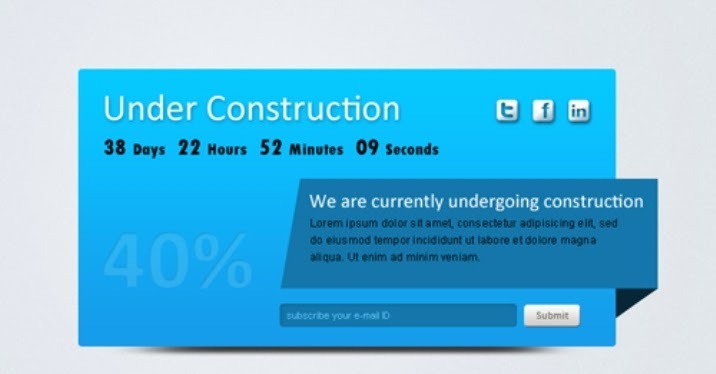 This is a simple one page “Coming Soon” template that allows you to keep your users informed, till your website is ready. Features are Valid PHP e-mail subscription form, Options panel, XHTML 1.0 Transitional valid, CSS 3 valid, Multi-browser compatibility (Internet Explorer 8+, Firefox, Safari, Opera, Chrome). Zoro is a clear and simple coming soon page. 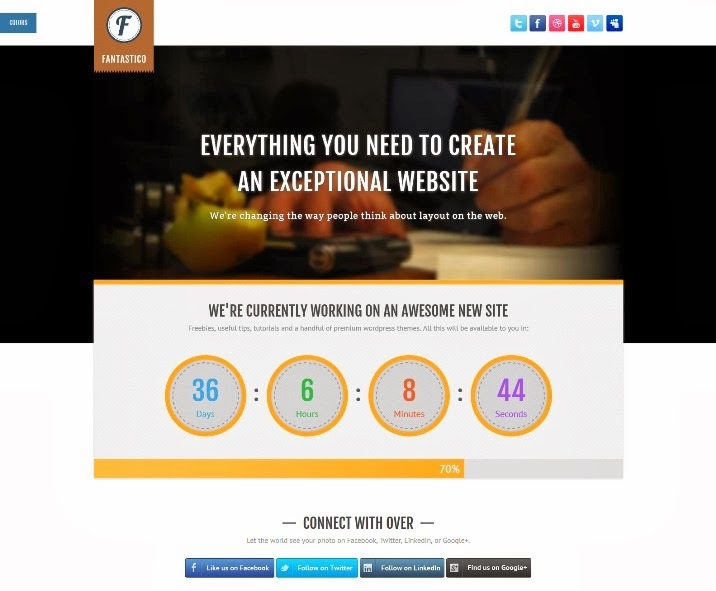 This template is designed to be fully responsive on any screen size & resolution. It will look great on any Desktop, Tablet or Smartphone and will have stunning crystal clear graphics for any Retina Display devices. Ice Breaker is a free domain parking theme for WordPress with four different color schemes, and easy customization through custom widgets and a theme options. “Float” is a great Responsive Minimal Coming Soon template coming with countdown and subscription form without refreshing the page. It has a animated subscribe and contact form, clean animation and different backgrounds which are change by random. “Float” is compatible with MacBook Pro’s Retina Display and it’s displayed perfect in all major browsers! 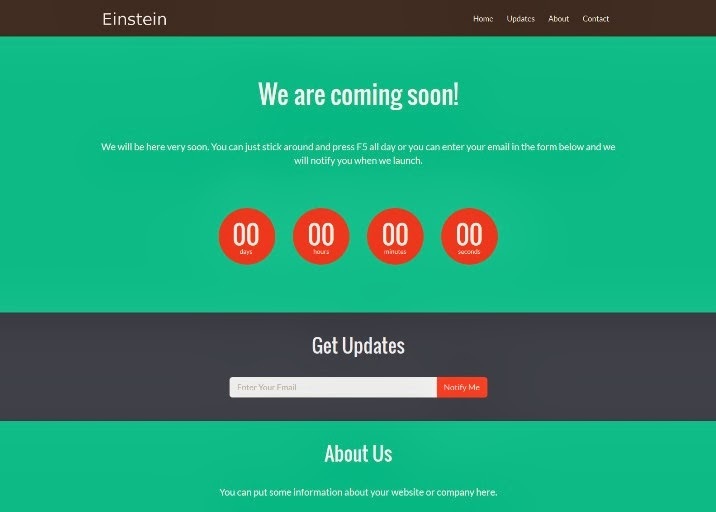 Einstein is a minimal, flat, and responsive coming soon template. Features: Countdown Timer, Email Signup with MailChimp Integration, Working Contact Form, Font Awesome Icons, Responsive, Retina Ready, and Flat Design. Offline is A modern and clean under construction template which will be suited for any future website.The theme is coded in such a way that with minimum effort you get maximum results. 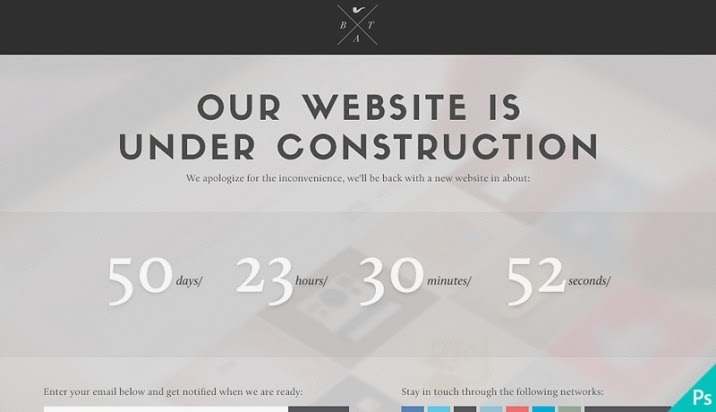 Clean single page “Under Construction” template is designed to keep your users up to date on your sites progress. Features: .psd file is well organized, Easy to modify & Change colors to your own, and Fully Customizable. 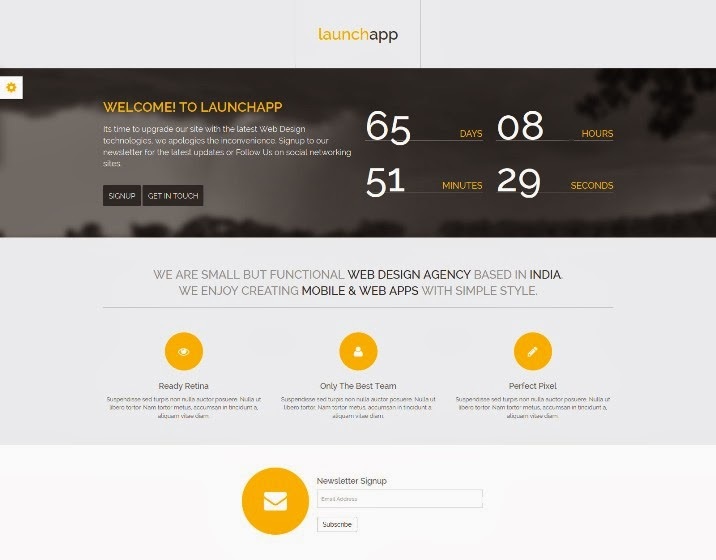 Launchapp is a fully responsive coming soon template to notify about your upcoming site. The html is very well commented to easy customize. Bootstrap 3 is used to design the overall look for this template, which you can easily customize with your templates. 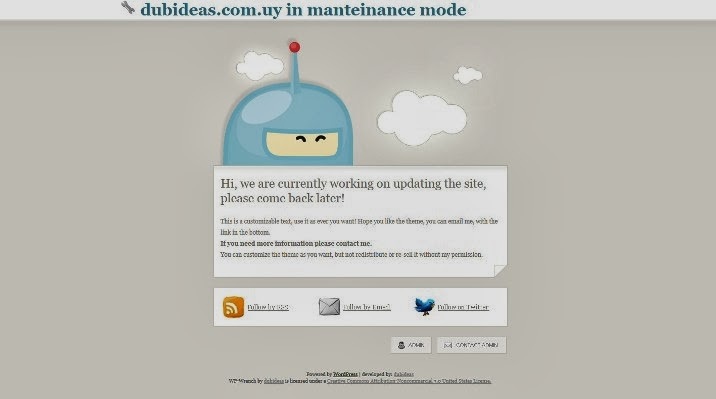 Anticipate is a maintenance mode plugin that allows you to serve your visitors an alternate “coming soon” page while you work on building your website in the background. 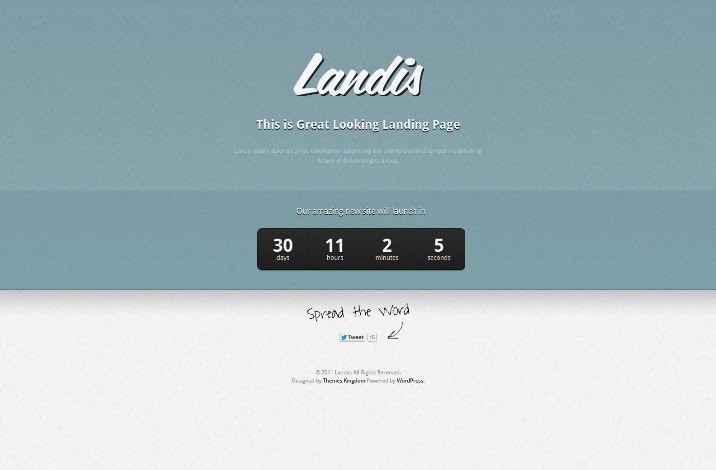 Once activated, all of your visitors will be sent to the Anticipate landing page. When logged in as a WordPress Admin, however, your normal theme appears, allowing you to build your website seamlessly in the background. 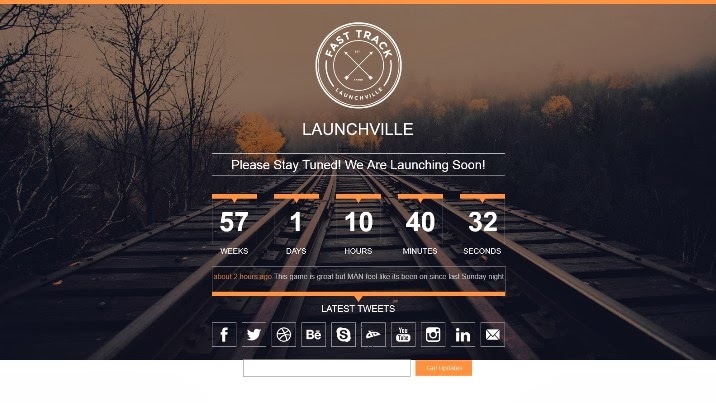 Launchville is a Responsive Coming Soon HTML template perfect for keeping your audience informed until your official website launch. Theme Features include: -Clean and Modern Design -Fully Responsive Layout -Twitter Feed/Custom Message Feed -Email Subscription Form -Countdown Timer -Full Screen Background -Extra Icons and Backgrounds. 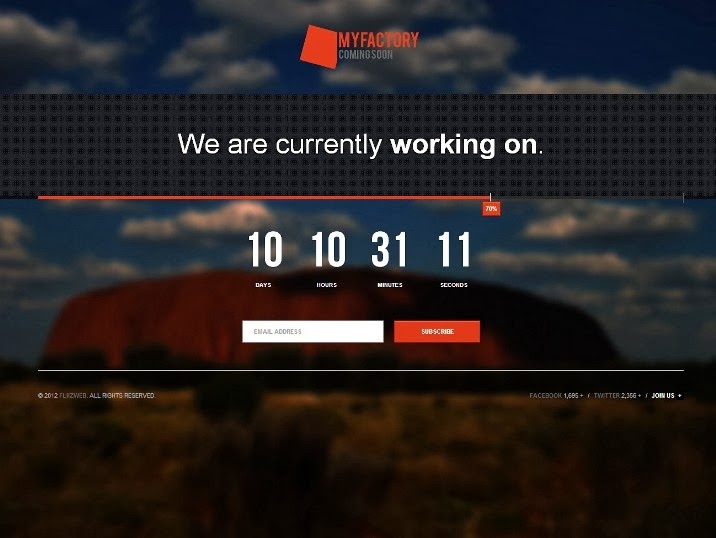 BLURRY is a Retina Display Ready Responsive Under Construction Theme built with HTML5 & CSS3. 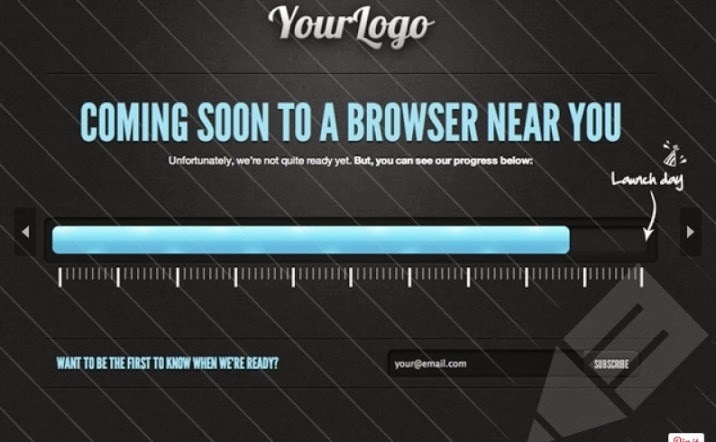 It is perfect for using as an indicator of a future launch of a web site or any other service. 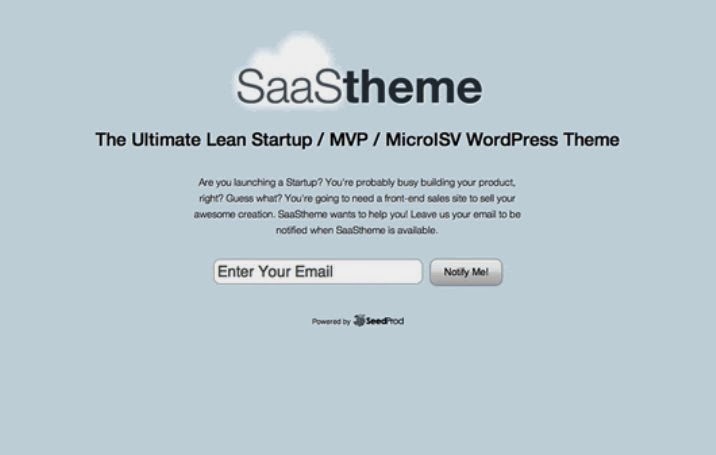 Theme customization is extremely easy even for non developers and is fully described in the included documentation. 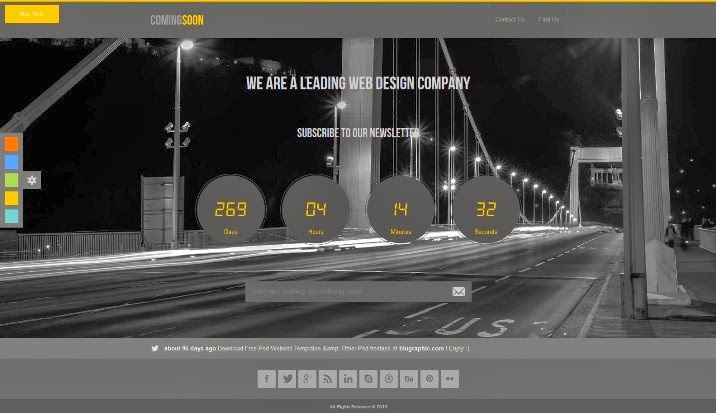 ComingSoon is a modern responsive coming soon/under construction template crafted with html5, css3 and jQuery.ComingSoon is very easy to customize as it is well documented and the source code is well commented. 8 COLORS is a Simple, Minimalistic, Responsive Coming Soon and Under Conctruction Page. It is based on Bootstrap. Georgia is a responsive coming soon HTML template with a clean and minimal design, beautiful clean typography and a fully functional contact form secured with a good looking CAPTCHA. myCounter is a simple coming soon page. Features are Fontawesome icons, Social media buttons, and Resizable ribbon. 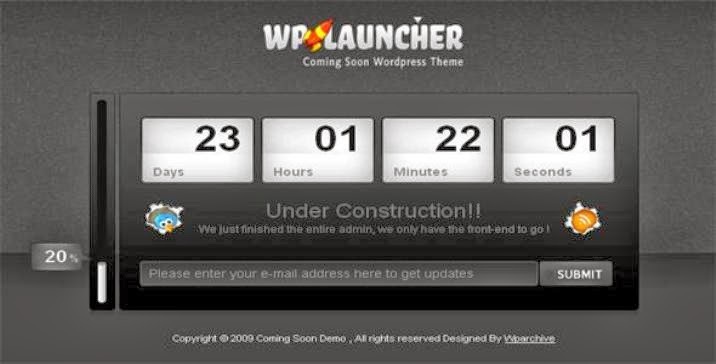 “Coming Soon” wordpress theme – something that we can develop in a day, can be useful in lots of different ways and Can be customized as per the user’s choice. Just before few minutes we completed the development of this theme and here’s the theme for you to download. In the design settings, we have provided all the options to choose colors of your choice in every aspects of the theme. You may change fonts, background color or image, content color, product image and so on. A modern, simple and elegant under construction template which will be suited for any future website.The theme is coded in such a way that with minimum effort you get maximum results. Duct is a fresh, modern, fully-featured Coming Soon HTML template. It features a “gravity well” effect, that shatters the background and forces the dials to follow the mouse. You can customize the number of shards to appear on the background, the radius at which they are activated, the shrinkage percent etc. Today once again we have a bit larger freebie, its a flat coming soon template. This freebie came out of an experiment, I wanted to include a serif typeface and an image based background, but still retain the look and feel of flat design. In case you don’t like the serif based version, I have also included one pure flat coming soon template in the zip file. I have to admit I spent more time on the serif based version, and once you check out the psd files, its quite obvious. 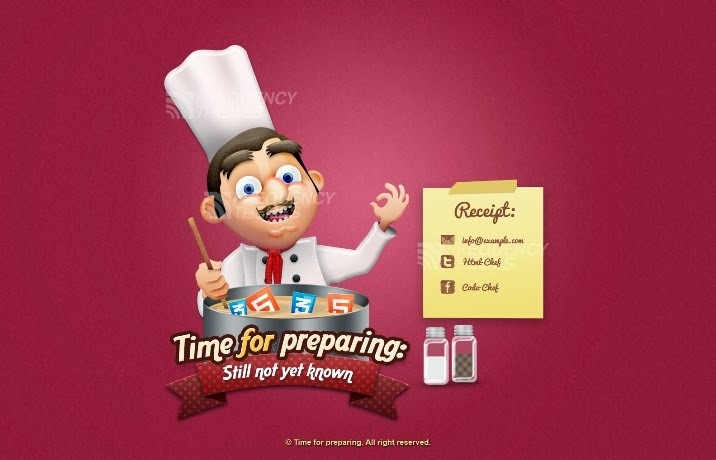 Chef Under Construction Page is funny, unique and great looking HTML5 under construction page that allows to keep users informed, till website is ready. PSD file is fully layered and layers are well named and organized within folders to make them easily accessible and use. Salad Template is fully responsive, simple, clean and mobile friendly coming soon page with nice countdown timer, parallax background, subscribe form and contact form. Its build based on Bootstrap 3.0, so it has many features. It is easy to install and customize. In general, you can create unlimited number of themes with our Compass/SASS Script. Salad Template is compatible with all major browsers on desktop, tablets and smartphone devices! Pond is a minimalist fully-featured Coming Soon HTML template. 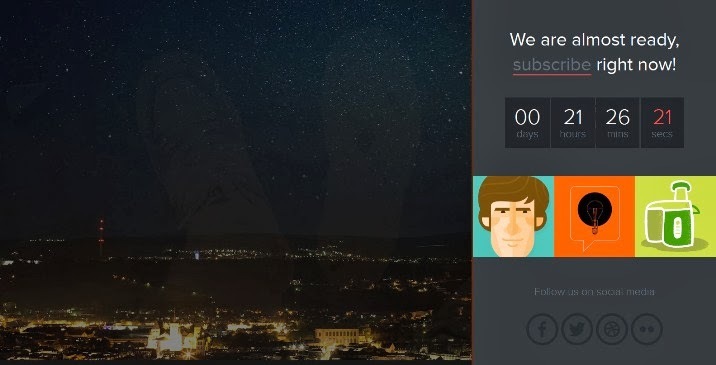 It includes a digital countdown timer, a parallax effect on the background, ripples effects for the background, a newsletter form and a contact form that use both user-side and server-side validations. Features: 4 colors – Green, Blue, Red & Grey, .psd files are well organized, Easy to modify & Change colors to your own, and Fully Customizable. 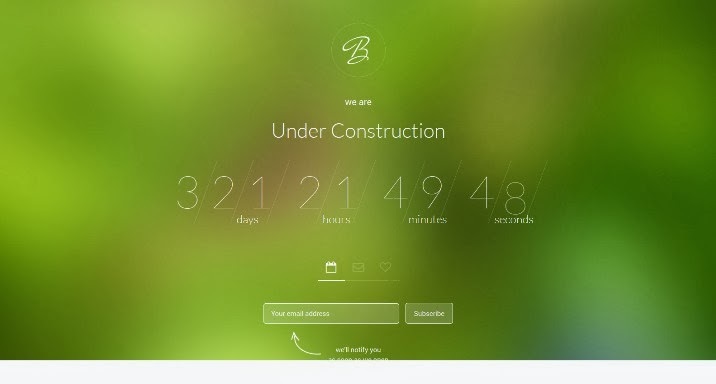 BuzzComi is fully responsive, simple, clean and mobile friendly coming soon / under construction page with nice countdown timer, subscribe and contact forms. BuzzComi comes with 3 colors but you can create your own color in a minute. Fully responsive HTML5/CSS3 Template. Its simple yet powerful. It has a sliding Subscription form. Eve is Responsive under construction or comingsoon template for you. Can be used for companies, individuals, and professionals. With full screen background slider and a jQuery countdown timer. This template is Valid Html so will work cross platforms and browsers. 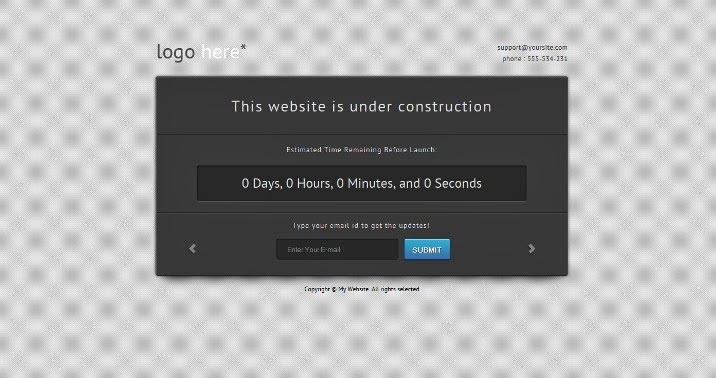 LaunchTime is a coming-soon page that you can use as a placeholder until your site is launched. Panic Station is a Responsive Coming Soon Page. 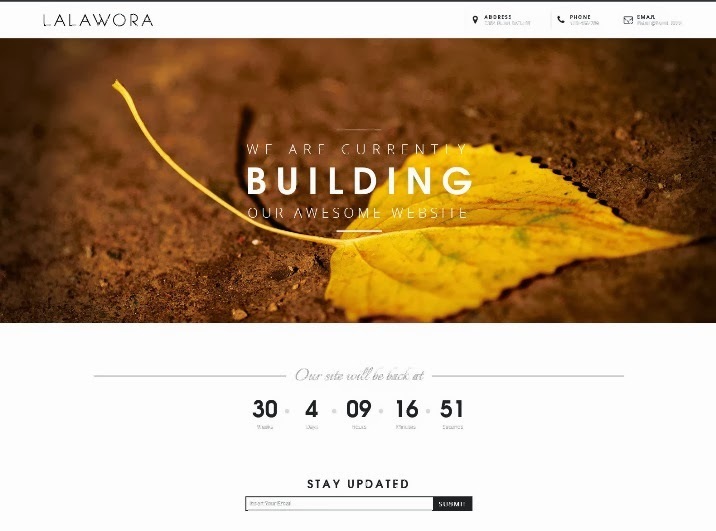 Lalawora is responsive coming soon page with clean and minimalist design. Its build based on twitter bootstrap. Features are Build with twitter bootstrap, Icon powered by Fontawesome, Responsive Design, Parallax Effect, Commented Code, and Ajax Contact & Subscribe Form. 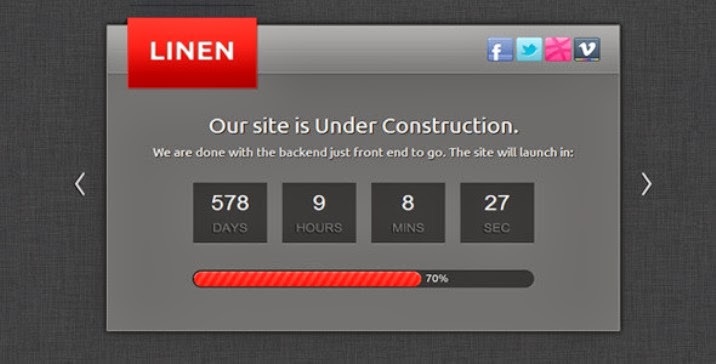 “Skyline” is a responsive HTML theme with countdown. 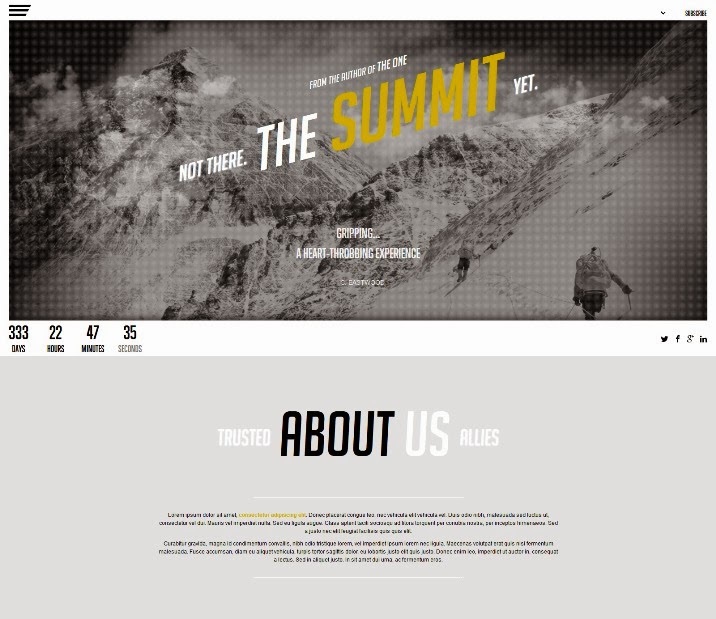 It has subscribe and feedback form, clean animation, fullscreen slider, team page, parallax effect and etc. And of course “Skyline” is compatible with MacBook Pro’s Retina Display and it’s displayed perfect in all major browsers! 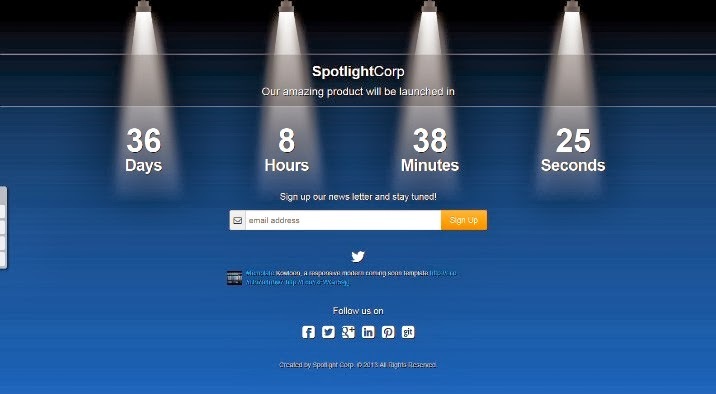 Spotlight is a fully responsive coming soon template. It features CSS3 spotlight animation and provides 3 different styles of Retina-ready spotlight images. 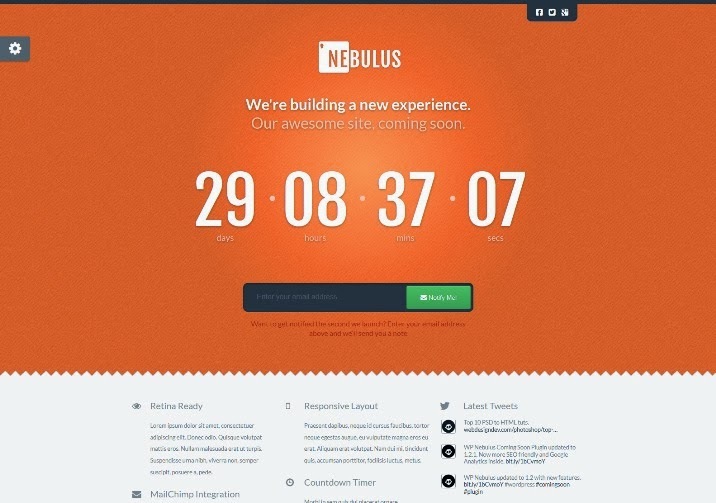 Nebulus is a responsive HTML5/CSS3 coming soon or under construction page that’s clean, cross browser compatible and easy to both use and modify. Designed to be a smooth user experience while providing the information that they need. It’s a simple way to let every one know you are about to launch something special. Worker is a Animated Under Construction Page. 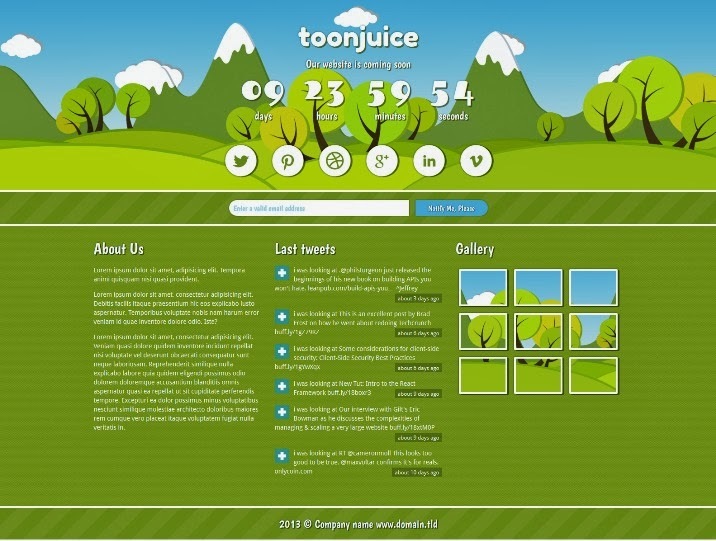 Toonjuice is a responsive coming soon website template with countdown timer, easy configurable animation, subscription form and many other features. 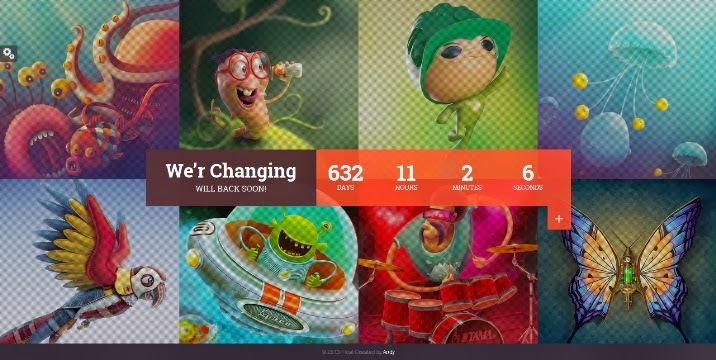 MyCountdown is a clean, minimalist and powerful coming soon HTML Theme. It is a strong platform for a website launching. 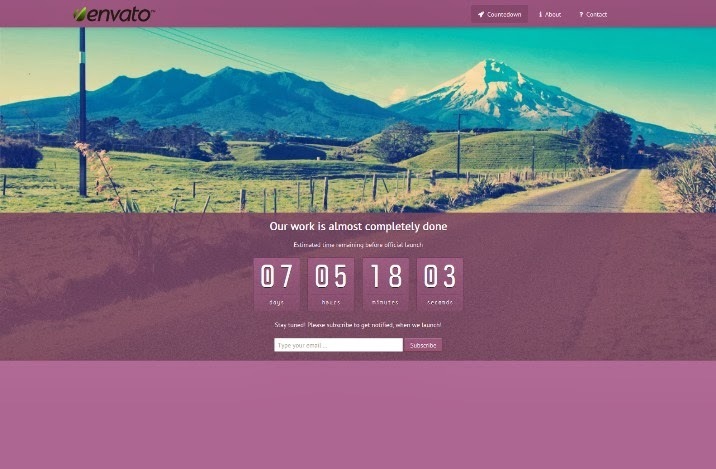 Fantastico Coming Soon is a simple one page template with beautiful and fantastic design that allows you to keep your users informed while you are building a new website or launch a app. 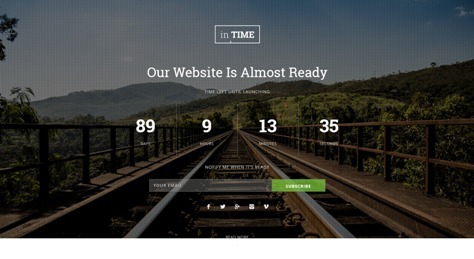 This html template completed with count down, process bar and subscribe form. 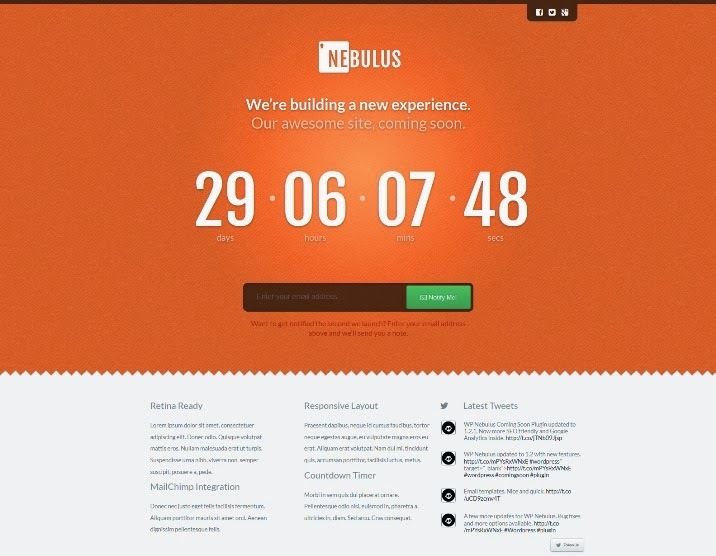 WP Nebulus is a responsive HTML5/CSS3 coming soon or under construction WordPress plugin that’s clean, minimalist, cross browser compatible and easy to both use and modify. Designed to be a smooth user experience while providing the information that they need. It’s a simple way to let every one know you are about to launch something special. 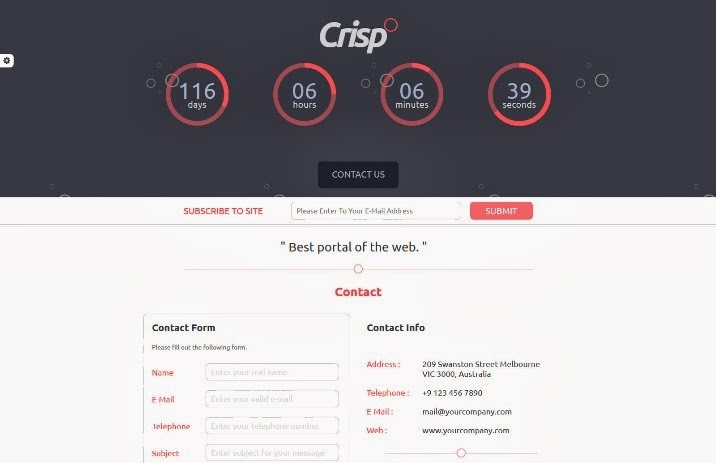 Crispo is a Responsive Coming Soon Countdown Template. Beautiful & contrast background makes Happyhour Coming Soon Template look really special. You product coming soon should be different from thousands of others pages. Now you can always be sure that your project is already interesting, by having subscribe fields. Collect your potential user/client database from this great looking coming soon template. 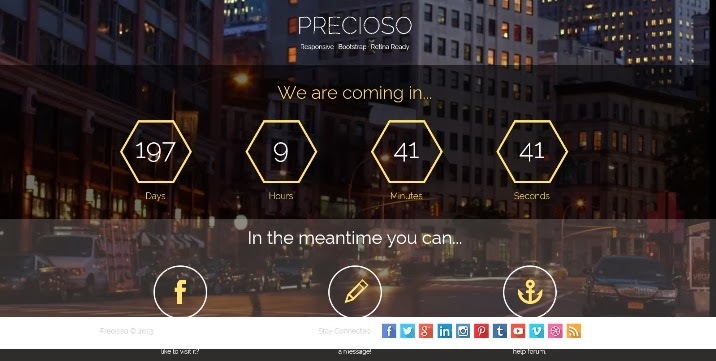 Beautiful Premium coming soon page. Multi templates pages. Compatible with Twitter bootstrap 2x. Modern, clean & professional looking 404 & Under Construction pages with multiple custom backgrounds. 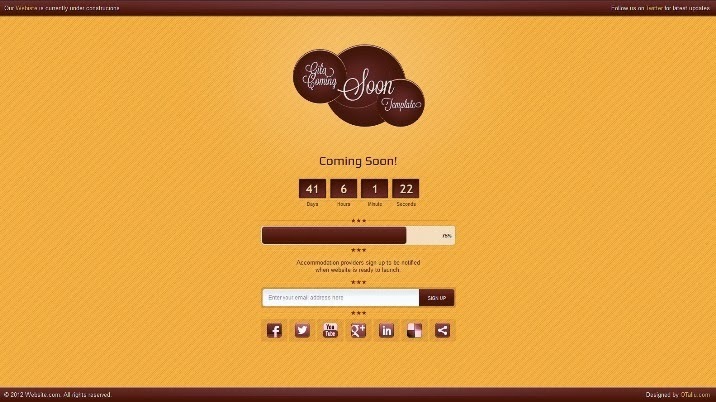 Gila is a Responsive Coming Soon Template. The purpose is to “hold” your visitors while you’re updating or changing something of your site, plugins or anything else you want to test. 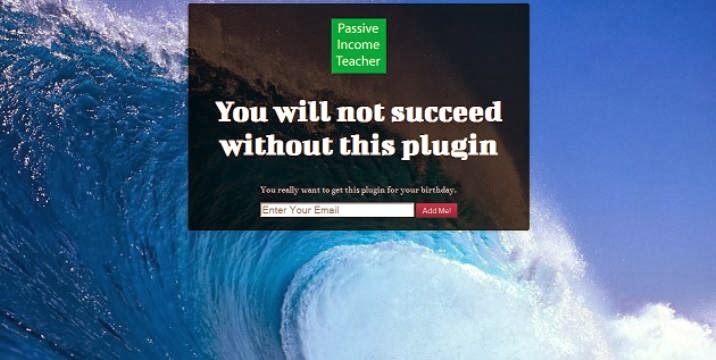 Features: WordPress back administration pannel, All links and text messages are customisable, Main image customisable, The RSS, Email and Twitter icons show up when you configure them from back, and XHTML/CSS Valid. 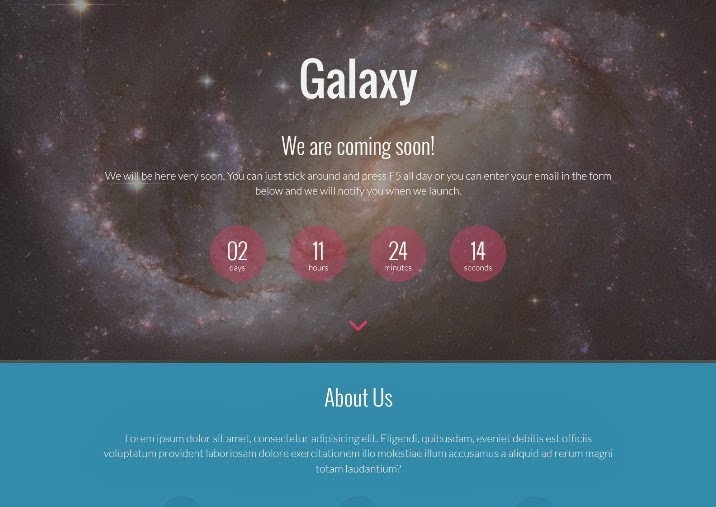 Galaxy is a responsive, unique, animated under construction template! Very easy to customize and use. This design is created as a template for pages that under construction, with a place to write your site name, slogan, Twitter updates, newsletter subscription, count down, social media links, in a slick and minimalist style. A Super Clean, Easy to Edit Under Constrction / Coming Soon Page. Any color fits and is possible. Linen is an elegant under construction template. The template comes with a working contact form and also you have the option to describe something about yourself. This template is very easy to use & you should be setup in less than 5 min. Features: 26 Custom made Backgrounds, Fontface, Animated Smoke Effect, Toggle Footer, Social icons, Full Background, Countdown Script, and Well Documented. 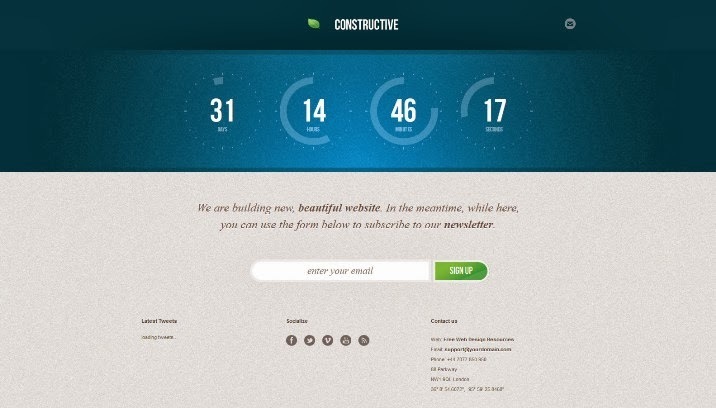 Constructive is an innovative Under Construction template with Powerful Admin Panel for novice users. That means no coding knowledge is needed! You can control all the setings with your mouse. The template comes with newsletter signup script, a working contact form, several themes in different colours and free, guaranteed support. 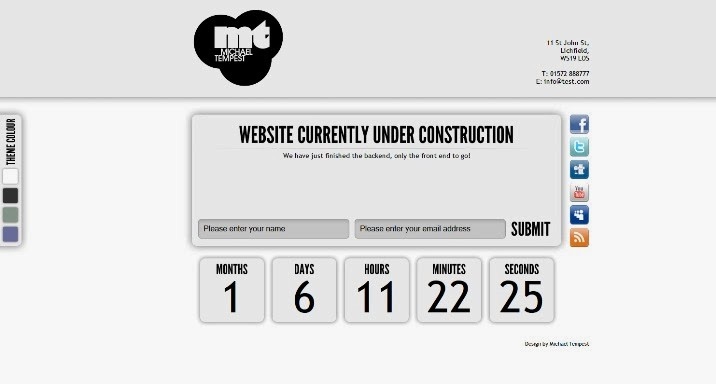 This is a simple, clean and effective Countdown / Coming Soon / Under Construction page template. It’s a single .php file wich holds all the neccessary things, like a notify e-mail and .csv processing. Let’s start with a blast! The first item is a free Under Construction template which comes in two versions: as a standalone PHP template and as a WordPress theme. They both have the same functionality, but if you prefer using your mouse than writing the code, WP theme is your weapon of choice. It would be really nice if you could place a link back to this page, once you decide to download this item, or leave a comment here if you like it. 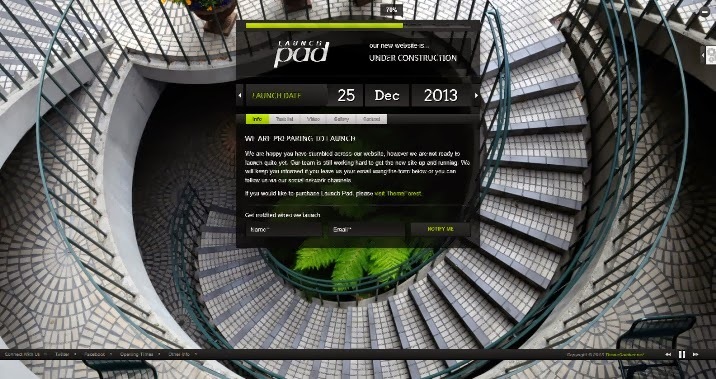 The pearl under construction webpage for the under construction website. This Template design can be used in start-up website for web , IPhone, Android or any Mobile website while its development or design process is going on. Website under Construction is free mobile website template.black and yellow houndstooth.That would be amazing. Comninations of yellow and black containing the color white.submit that allow visitors subscription to get hot new when your website already completed. There are more option for reader subscription such as email subscription, facebook, twitter, google plus… etc. Speedo is a Responsive Design compatible in all browsers and mobiles, Tablet pc’s. This product release Under Creative Commons Attribution 3.0 License. 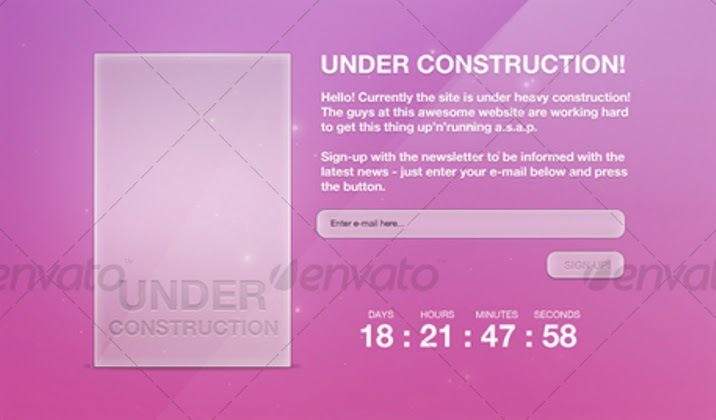 The Coming Soon Under Construction Count Down Template was built to fill the gap between between getting the job and having the final site live. But it’s more than just a placeholder page because you can easily turn this micro site into a mini portfolio or product showcase with image gallery, video, and mp3 player. It also comes with an alternate mobile web page for any iPhone users that visit your site.